Today’s Times investigates commercial property valuations for the purpose of tax collection. The article suggests that brick-and-mortar retailers are gaming the system to unfairly reduce their property value and therefore pay local governments less in taxes. In Michigan, from 2013 to 2017, this may have cost local government $100 million. 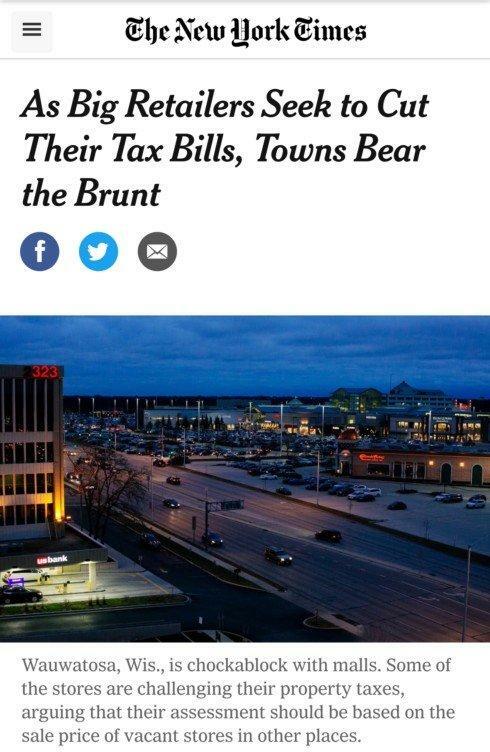 While on the topic of investigating the actors in tax generation, here’s a story idea: the Times can take nurses, teachers, and civil servants to task for shopping at Amazon and defunding their local community’s tax coffers--while having their salary rely on this very local tax base. They’re shooting themselves in the foot. It’s like a drug problem. We have narco dealers and narco users. But in this case the addiction is: cheap online shopping regardless of the long-term costs. Our communities are going to suffer more tax and job loss unless we address this soon.